Alright, as previous posts indicate, I have successful stalked the internets for the June Burda preview. And, luckily, the patterns I really like for next month all fall in the normal size ranges. Of course, I have not been so lucky with my previous issues for February, April, or May. Sadly, both of these patterns are in the plus sized 44-52 range. 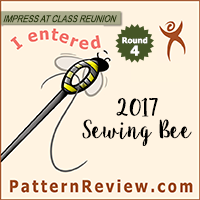 While grading down from a 44 to a 40 might not be too difficult, I still consider myself a newbie to Burda, so I am not sure if I am ready to try altering those pattern quite so much yet. But they came in non-standard sizing: 17-21. I had no idea what this was, but I had only just figured out that I should be something around a size 40 up top and a size 42 on the bottom. I was just sewing up my first Burda pattern, so I eventually figured out that the 17-21 was petite sizing, but I wasn’t sure what that meant, except that I wouldn’t be making these pants any time soon. BurdaStyle 05-2011-106. May Best of BS award winner! Which is sized 72-88! Argh! I found out this is sized for “tall,” but, like petite, had no idea what this meant in terms of actual sizing. I figured I would have a better go with tall than short, but I still needed to figure out what that meant. So, all you have to do to pick out the correct petite/tall size is take your regular number and either divide by two or multiply by two. For example, I like those petite pants from April, so all I have to do is take 42/2 = 21. So I would trace a 21. For the tall dress I need a combo of 40 and 42 x 2 = 80 and 84. Then, once you have traced the pattern, you either have to add or decrease length. The regular sizes are sized for a person who is 168cm, around 5’6″ in height. Petite is for 160cm, approximately 5’3″ height; and tall 176cm, around 5’9″. So, clearly, going from a Petite to regular will need an increase in length the same amount that going tall to regular would need a decrease. Going from tall to petite might be a bit of a challenge, because that is a lot of length being taken out, but I would be curious if someone tried it. In any case, there are several lines that must be adjusted to change the length appropriately. The values on the chart are given in mm, but I will convert to centimeters and approximate inches for those who don’t have metric measuring instruments. Also, the sides of these sleeves must be taken in or widened at the seams, tapering to the cuff, so they fit in the armhole (bottom sleeve picture in the outlined box above). Total length adjustments: 60mm = 6.0cm = 2.36″ = 2 3/8″ (but if you go by the estimated inch values above, it is actually 2 5/8″). This is for an 8cm height difference, the total length needs to be adjusted by 6cm. 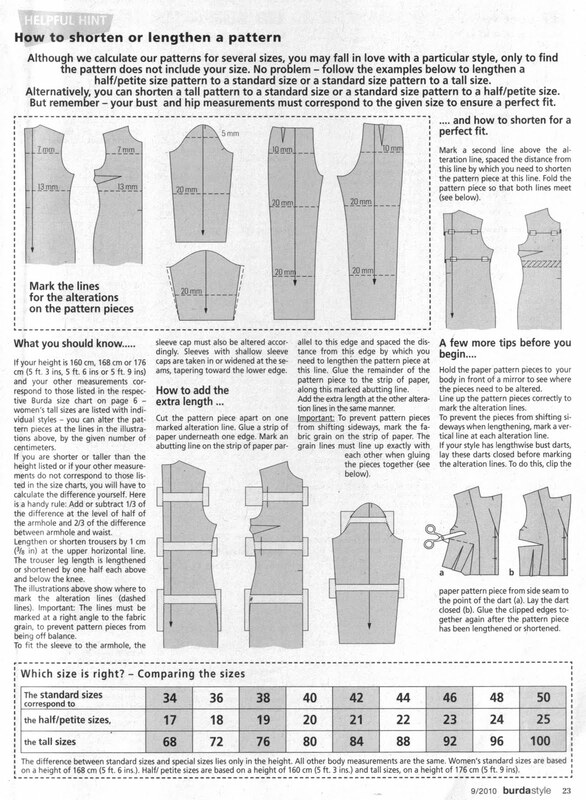 This can help you figure out how much length alteration you may need. Unless you are like me, where you have an extremely long torso and short/average legs. I would probably shorten the tall dress then re-lengthen it just to make sure it was going to hit the right spots. For the petite pants, I will just lengthen them as suggested, but I will also be sure to make a muslin. Of course, then there are the children sizes (100s) and men sizes (???) and the maternity clothes. I haven’t even begun to figure those out yet, so don’t ask. I don’t really have a need for any of them, so I haven’t really worked to figure them out, but if I ever find the need in the future, it will be another sizing post then. So, there. Falling in love with a petite/tall size is not the end of the world. Falling in love with a plus size… I am still working on that one, but I might be close enough that I could eek by doing my own re-sizing. 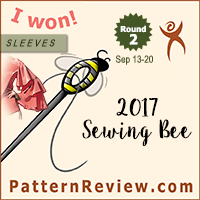 Especially for a knit pattern. For that coat, well. I have other coat patterns. But I still totally want one in a jacquard or brocade!